Photo taken by John Phelan, via Wikimedia Commons. It is true that Toscanini’s is farther than Harvard Square. 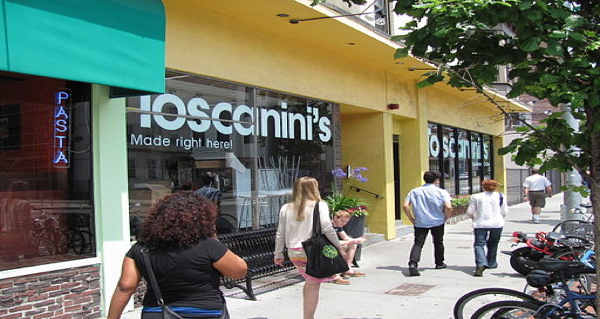 It is true that it is far enough that you could even take the T. But going to Toscanini’s isn’t just about getting ice cream; it’s an occasion. (An occasion that I take advantage of much too often.) And while it may be more of a schlep, it is completely worth it. To demonstrate how many times I have been to Toscanini’s, I can tell you all of the amazing flavors from personal experience. Ginger snap molasses, coffee, cocoa pudding, chocolate #3, cookie dough, butter almond, Aztec chocolate…the list could go on and on. And now serving soft serve, Toscanini’s has something for every ice cream lover. But I must talk about one flavor in particular: the Toscanini’s flavor. B3 is pretty much everything you could ever want in an ice cream flavor: brown butter, brown sugar, and brownie bits. It is decadent (a kiddie cup—micro cup in Toscanini’s speak—is more than enough), creamy, and absolutely delicious. My most recent Toscanini’s excursion was motivated by an upcoming paper. A paper that I really didn’t want to write. And what better excuse to take the trek down Mass Ave than for an ice cream-incentivized study break. I got the chocolate chip, which might seem a bit boring, but it is absolutely fantastic. Toscanini’s flavors taste exactly like their name. They taste as though were just made (and with rotating flavors, this is often the case). Their vanilla is so creamy, and their chocolate chips (more like chocolate chunks) are like a high-end chocolate bar. Unlike a typical cream store, Toscanini’s has more of a coffee shop vibe. Quiet but not too quiet, lots of students, good lighting, and most importantly, the presence of great food and drinks. I’ve been for birthdays, for days when I just need a good cup of ice cream, and most often, I’ve been when I just need to get off-campus to study. My paper is now complete and I cannot wait for the next excuse to make the journey to get my favorite Cambridge ice cream. Note: Basia will be publishing a Best of Boston Ice Cream series – check back for more next week!